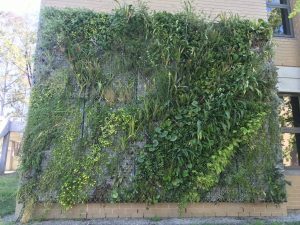 Universities across Australia are installing greenwalls in an attempt to increase concentration levels. La Trobe University with its mainly native planting covering 20 sqm. Australia based The Greenwall Company has now worked with a number of universities, including The University of Queensland and La Trobe University, to design and install their patented greenwall technology. “There have been a number of studies conducted to prove the benefits of greening community spaces, one of which is improved concentration levels,” says horticulturist and founder of The Greenwall Company, Mark Paul. A study conducted by Dr Kate Lee* from the University of Melbourne revealed that glancing out at a greenroof for only 40 seconds markedly boosts concentration. Beyond the increase in concentration levels, greenwalls help to improve air quality, are aesthetically appealing, lower power bills and even act as an insulator, says Paul. 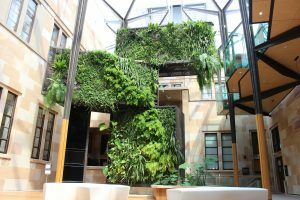 In 2013, The University of Queensland introduced their six green-star rated Global Change Institute Building, which features greenwalls as the key design feature. To facilitate the idea of a “living building”, a 70m2 panelled greenwall was installed over the airconditioning vent, serving as part of the air filtration system. The greenwall design also included a pond of native rainbow fish with water plants and a vertical wetland to strip nutrients from the pondwater. “A simple ecological system truly embodied the university’s green ethos and ongoing commitment to sustainability in research and education,” says Paul. More recently, The Greenwall Company has completed the installation of a greenwall at La Trobe University in Melbourne featuring a mainly native planting covering 20 sqm. Greenwall Company worked with the students and the university’s native plant nursery to incorporate plants grown on site.